Wandering through the museum’s Native Art of the Americas galleries on the third floor, you see cloth, basketry, metal works, carved furnishings and more—a variety of objects from the history and life of the Northwest Coast people. 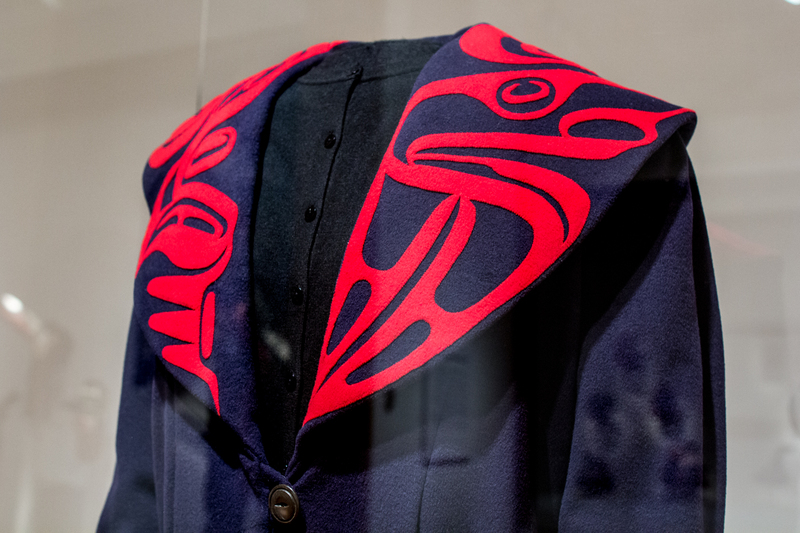 Around the corner, it’s hard to miss Preston Singletary’s large work, but look to the left for an understated piece: the Eagle Shawl Collar Coat by Haida designer Dorothy Grant. In earlier walks through the gallery, I admired the well-structured coat with its contrasting-red appliqué collar and feminine bishop sleeve. I even imagined how wearing the haute couture garment might transform my style and mood on a rainy day. But recently, considering pieces in our collection from a lens of social justice, I found new meaning in this coat. Fashion has incredible power (remember this year’s Golden Globes? ), and Grant’s work is no exception. The Eagle Shawl Collar Coat links a rich history of innovation with a contemporary mode of expression, capable of transforming and inspiring conversation. 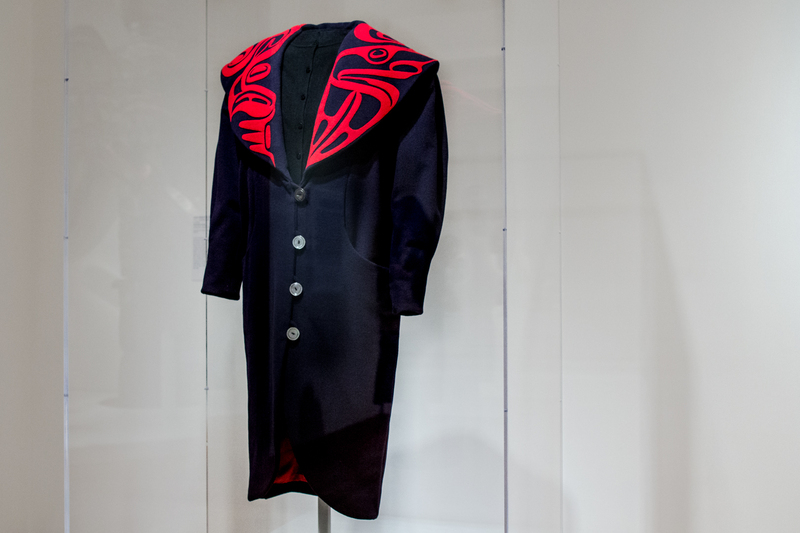 The design of the coat, can be traced to button blankets, the original ceremonial dress of the Haida people1, which Dorothy learned to sew as a young teen. She studied closely with Haida Gwaii elder and knowledge-keeper Florence Davidson, and eventually innovated the traditional garment, altering the neckline so it would hang more comfortably. Grant continued to innovate after her graduation from Helen Lefeaux School of Fashion Design in Vancouver, British Columbia: she launched her haute couture Feastwear line and became the first designer to combine Haida art and fashion. Image: Eagle Shawl Collar Coat, 1990 – 91, Dorothy Grant, wool, cashmere, silk, mother of pearl buttons, 46 × 21 1/2in., Ancient and Native American Art Acquisition Fund, 2014.13 © Artist or Artist’s Estate. 1 Button blankets were introduced as early as the 1840s, after early missionaries denounced the totem poles of the Northwest Coast people. The Haida placed crests of their histories onto cloth instead—elder Florence Davidson referred to button blankets as “totem poles on cloth”—and created a new form of storytelling from the act of oppression.